James Patterson is best known for his adult crime novels. However, this talented, multi-faceted writer has developed a series for younger readers that are set in Middle School and called simply his Middle School series. He has also written another young adult series books, including Maxium Ride, Daniel X and Witch and Wizard. Patterson was the 2010 Children's Choice Book Awards author of the year. The series is meant for middle school-aged children and starts with Middle School, The Worst Years of My Life. The setting is simply a middle school and focuses on the types of problems that middle school kids face in day-to-day school life. Noted by CNN, the first book in the series hit number one on the New York Times best-seller list and was a number one Indiebound best-seller according to a report. The first book also won the Young Adult Library Services Association 2012 Top Ten Quick Picks for Reluctant Readers award. As of fall 2014, six books have been released in the series. The books are available in a variety of formats, including hardcover, paperback, ebook and audiobook. 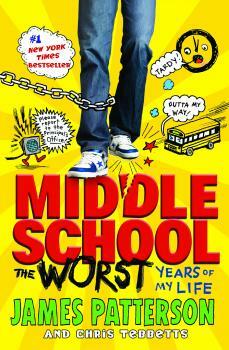 Middle School: The Worst Years of My Life is the first in the Middle School series by James Patterson. Released November of 2012, the story features the character Rafe Khatchadorian. Rafe attends Hills Village Middle School, and this year promises to be his worst year ever. There are issues at home as well. His plan? To have the best year ever. To make his best year ever happen, he comes up with a game that gives him points for breaking rules in the school's Code of Conduct. He then attempts to earn points for things like chewing gum when he isn't supposed to or running in the hallways. This second book in the series is the sequel to Rafe Khatchadorian's sixth grade year of middle school. Rafe is now in seventh grade and is on his way to a charter school focused on art. In his mind, math and history will soon be a thing of the past, but the new school isn't anything like that and Rafe finds himself challenged more than ever before. However, through the process of discovering his artistic side, Rafe also discovers some family secrets. This is the third installment in the Middle School series and this time the main character is Georgia Khatchadorian, the younger sister of Rafe. She bet her big brother she'll become popular. Unfortunately, Rafe's trouble-making ways may come back to haunt her. This book lets the reader catch up with the character from the first two books while being introduced to new characters at the same time. It also offers a different perspective on Rafe and his antics. Follow Rafe again, only this time to summer camp. Unfortunately, it isn't going to be all fun and games as the camp is a "school" camp. He and his friends stir up trouble, but Rafe soon makes close friends and learns that people are not always how they first appear. This book gives kids an opportunity to learn a few of Rafe's life lessons without actually making the same mistakes themselves. This book is a bit different than the other books in the series, because it is an interactive book. The book features siblings Rafe and Georgia Khatchadorian. They battle back and forth and the reader gets to join in through writing and drawing prompts. Learn more about the characters as they each tell a different side of the story. Book six takes readers back to the character Rafe. After a difficult summer, Rafe is going back to the school he loathes. If he can't pass a test in summer school, then he will also be held back a year, which means even more time at Hills Village Middle School. Join with him as he trains for a grueling test at the end of summer. Patterson's middle school books have received mostly positive reviews. School Library Journal included his first book in the series in a roundup of books that are good to encourage reluctant readers, because they are fun and fast-paced. About Middle School: The Worst Years of My Life, SLJ said the book had "strong characterizations" and a "colloquial" style. The Los Angeles Times praised Middle School: The Worst Years of My Life and said that Patterson has an astute understanding of what makes young boys want to read books. 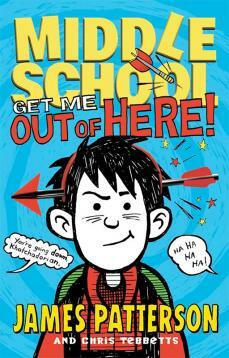 Story Snoops said those who loved Diary of a Wimpy Kid will also love the Middle School books. Has some "mild language" and "fist-fighting." Associated Press also gave the book positive reviews, stating that readers will relate to the main character, Rafe. Kirkus Reviews dubbed it a "satisfying and progressive" tale. Publishers Weekly praised the book for its short chapters and message that "normal is boring." Upon first looking at the main character of some of these books, which is a trouble-making middle schooler who doesn't always follow the rules, some parents may be concerned about the example the main character sets for youth. However, the overall message shows that causing trouble doesn't pay and presents some positive role models for kids to follow. Common Sense Media breaks down each book, informing parents of everything from a kiss that occurs in one of the books to whether there is any violence. There are also parent reviews with spoilers. Ultimately, parents must decide if the humor and life lessons presented outweigh any concerns about negative behavior from some of the characters. The first book in the series, Middle School: The Worst Years of My Life, has 4.5 out of 5 stars and over 2,000 reviews on Amazon. Middle School: Get Me Out of Here!, book number two in the series, has an average of 4.19 out of 5 stars on Good Reads. Reviewers left comments such as "great book", "recommend" and "fantastically developed character." Middle School: My Brother Is a Big, Fat Liar gets rave reviews on Amazon, hitting a stellar 5 out of 5 stars. Reviewers stated that they "enjoyed catching up with Rafe through his sister's point of view" and that it was a "fun book to read with 10 year old." 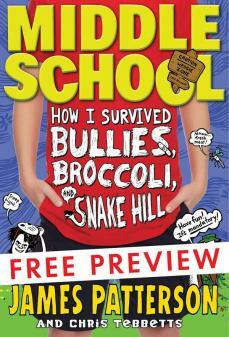 Middle School: How I Survived Bullies, Broccoli, and Snake Hill has 4.5 out of 5 stars on Barnes and Noble. Readers say the book offers "life lessons," and is "amazing" and "hilarious." Middle School: Ultimate Showdown has 4.1 out of 5 stars on Good Reads. One reader wrote that the book was "very entertaining" and compared it to Diary of a Wimpy Kid. Middle School: Save Rafe! has 4.5 out of 5 stars on Barnes and Noble. Reviews note that the book is "exemplary" and "jam-packed with emotions and action." Is the Middle School Series Right for Your Child? The suggested age range for James Patterson's Middle School series of books is fifth through seventh grade. If your child is around this age range, then these books could be a fun read. However, if you are concerned about the negative behavior mentioned above out of some characters, then your best bet is to read the first book or two and make sure you feel it is appropriate for your child.